Step 1: Cut out a circle of cardstock to the size that you want your candy to be. Step 2: Inflate two 160Q balloons in different colors. Knot and trim the balloon tails. Step 3: Create a spiral with your balloons. Use loops of gaffer’s tape to adhere the balloons to the cardstock circle. Step 4: Tape the jumbo balloon stick to the back of the cardstock. 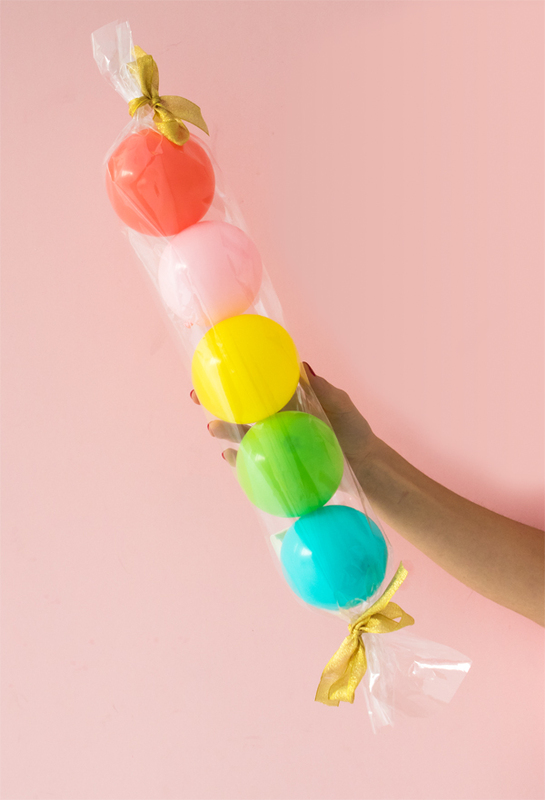 Step 5: Wrap the balloon lollipop in cellophane and tape to secure. 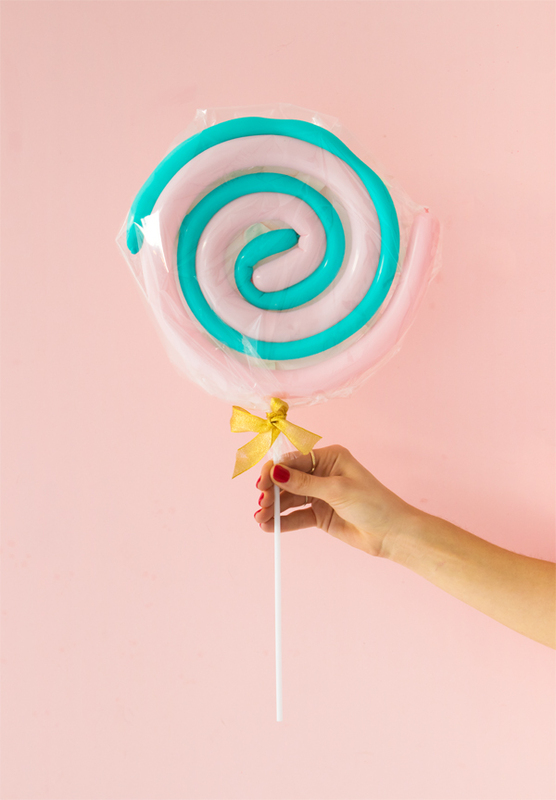 Gather the cellophane at the bottom of your lollipop around the balloon stick and tie with a ribbon. Step 1: Partially inflate a 5” or 11” balloon, making sure to keep its round shape. Knot and trim off the balloon tail. 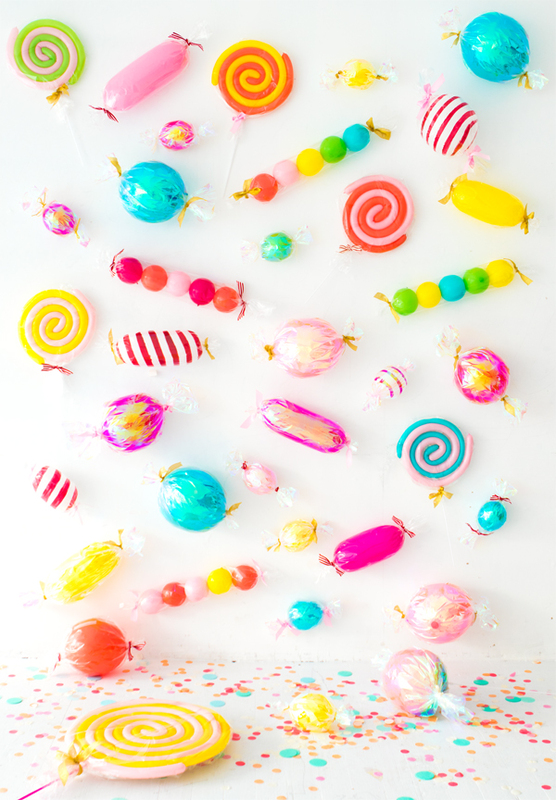 Step 2: Wrap your balloon candy in cellophane and tape to secure. Tie off both ends of the cellophane with ribbon. Spread the cellophane edges with your fingers. Step 1: Inflate a white 660Q balloon to the length you desire. Knot the balloon on both ends and trim off the leftovers. 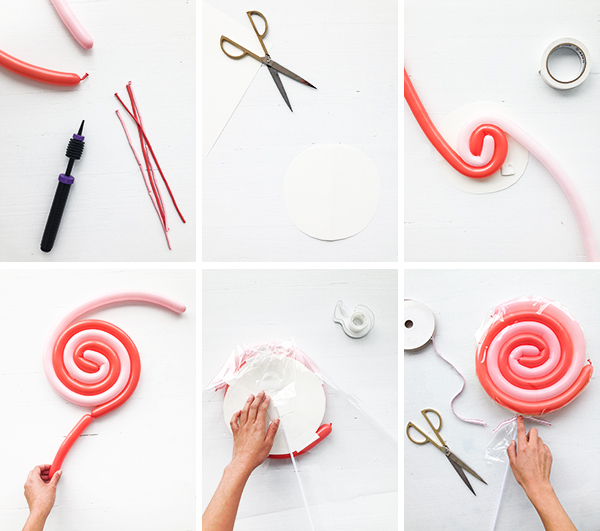 Tape the balloon to your work surface with a loop of tape. Step 2: Paint red diagonal stripes on the top half of the balloon and let dry. Don’t worry about painting the bottom half since it will not be visible once taped to the wall. 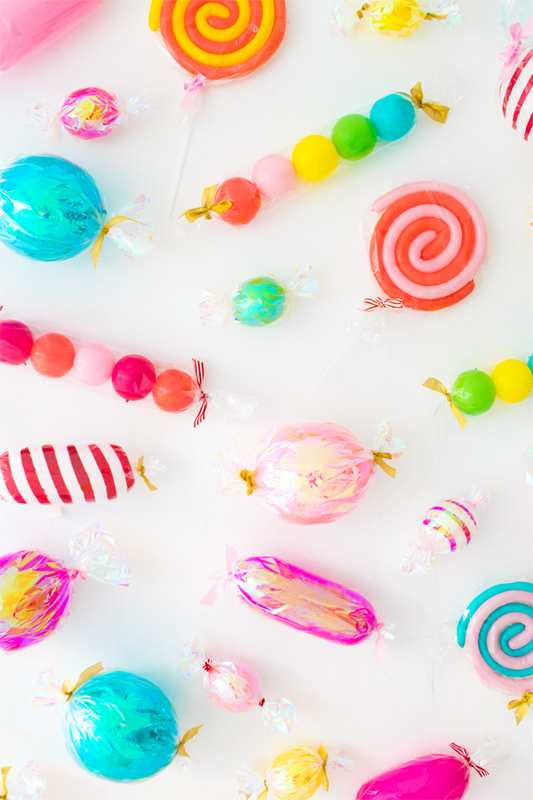 Step 3: Wrap your striped candy balloon in cellophane and tape to secure. Gather the ends of the cellophane and tie with ribbon. 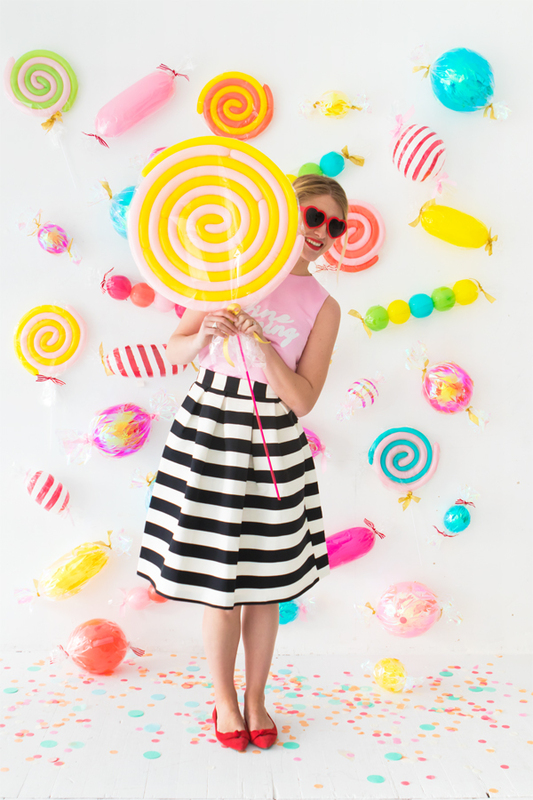 Tape the candy pieces to your photobooth backdrop using loops of gaffer’s tape. You can use a couple loops to keep larger pieces from falling. 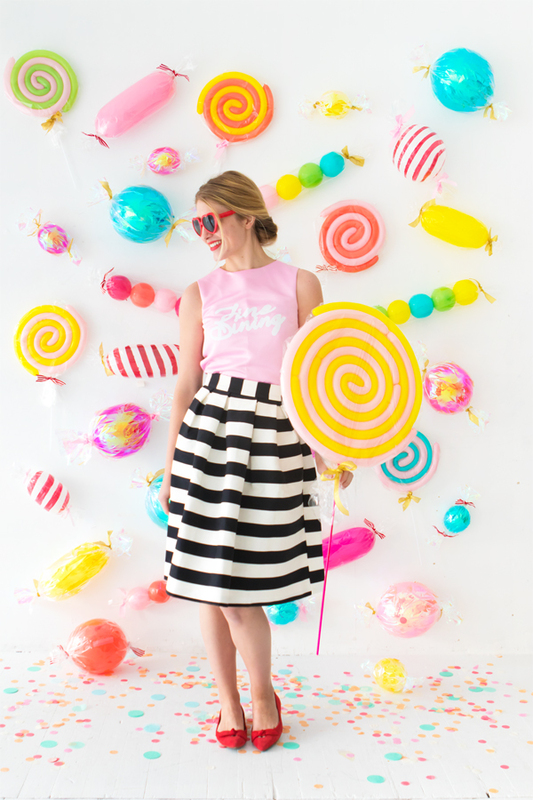 What a cool idea, I love the lollipops! This backdrop is TOO CUTE! 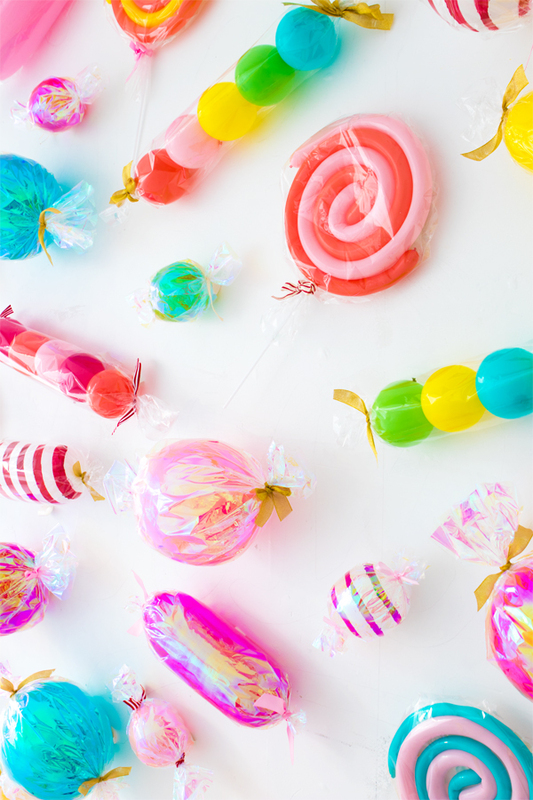 Who knew the way to make any colorful object was to just wrap it in cellophane? It works, and it’s awesome. I’m all here for this! Love it!